We took the two hour dri ve to Seoul from Chuncheon, arriving in the late afternoon. Our Guesthouse was situated right in the middle of Hongdae – a district known for its arts, culture and active nightlife – and true to its reputation, there was a music festival happening that weekend. Every year, Zendari Festa music festival showcases “the heart of independent culture in Korea” alongside bands from all around the world. 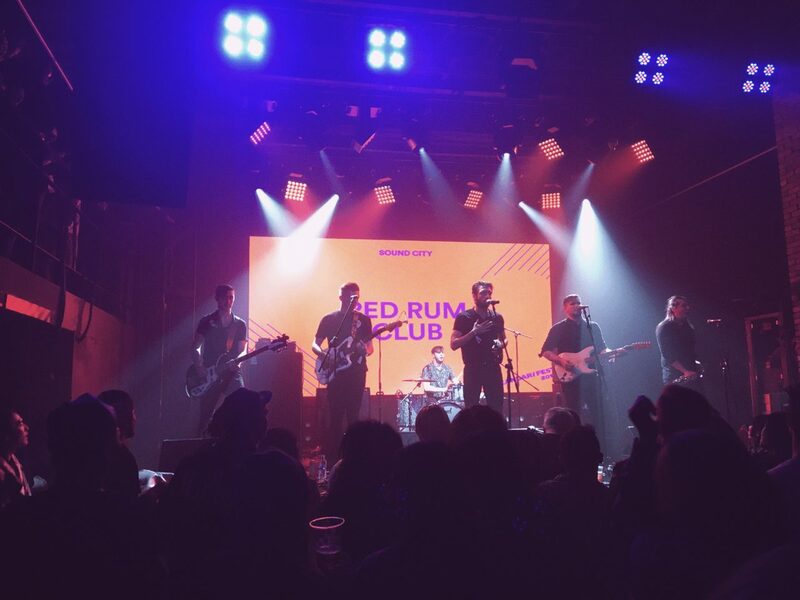 Lots of shows happen all weekend across multiple venues in Hongdae, with special gigs focusing on different countries. Belgium, France, and the UK were all the showcasing their talent that weekend. There was an exciting atmosphere as we descended into the first venue of the night, packed with people enjoying the music. 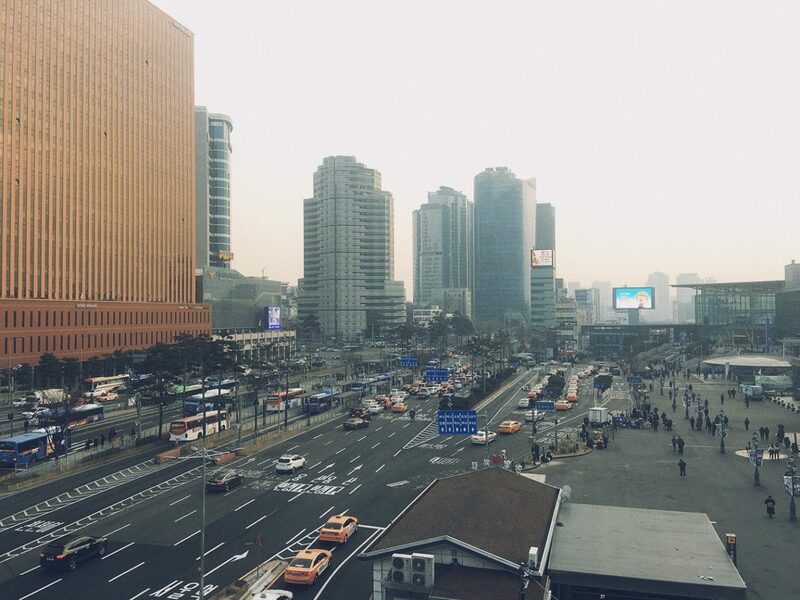 It was a great introduction to Seoul’s nightlife. We had planned to try and catch some live music, so this was a blessing. We continued to come back over the next 3 evenings. What is there to do on a rainy day in Seoul? Well, we visited the National Museum of Korea in the Yongsan district – about 40 mins by subway from Hongdae. Covering thousands of years of Korean history, its exhibitions are vast and there are art collections from many of the important periods of Korea’s past. I would definitely recommend a full day to see the whole museum as we spent a couple of hours there and didn’t even get to see half of it. But to learn how much the country has changed, even in the last 100 years, was fascinating. I’ll definitely be back the next time I’m in Seoul. After all that walking about the museum, we needed a bit of a rest. Comic Book Cafes offer a relaxed atmosphere if you fancy some reading and a bit of a break. These cafes are designed to be cozy and comfortable, perfect for reading. If you fancy a bit more privacy, you can rent a booth where you can sprawl out on the floor. Good for napping! The next day, we headed just outside of Seoul in the afternoon to Anyang. It is possible to reach on the Subway, but we drove. Both take about an hour. We had a great buffet lunch there, spending some time in the city centre and playing games in the arcade after. 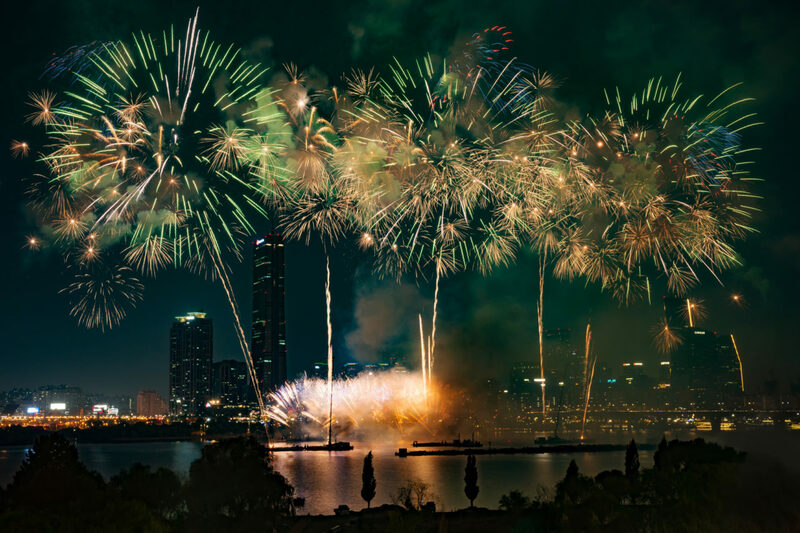 That evening, the Seoul International Fireworks Festival was taking place. Crossing over the Han River on our way back into Seoul, all the cars had pulled to the side of the bridge to watch the display. We joined them as the colours exploded over the river. Overall it was great, but the finale was magnificent. The whole sky seemed to lit up with such a huge bang that I felt in my chest. We were lucky to have caught that. 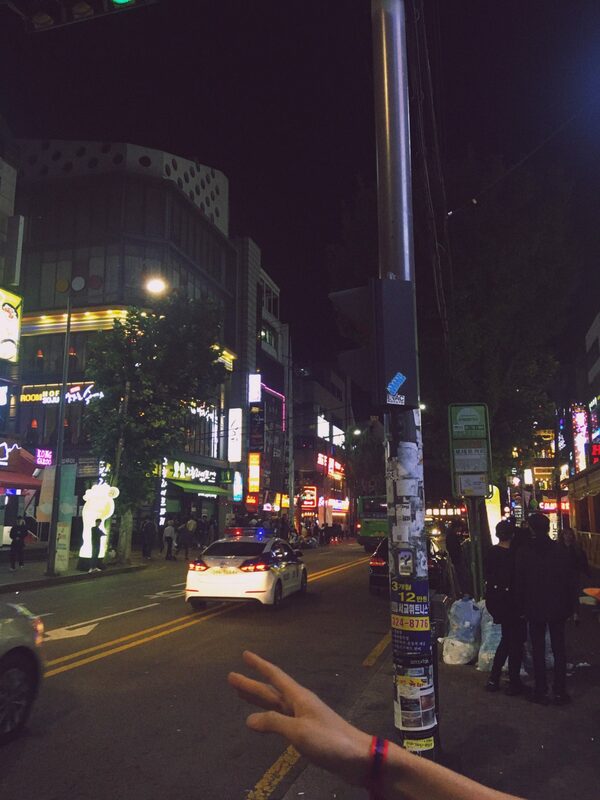 After, we decided to spend some time in Itaewon, an area known for its cultural diversity, shopping and nightlife. 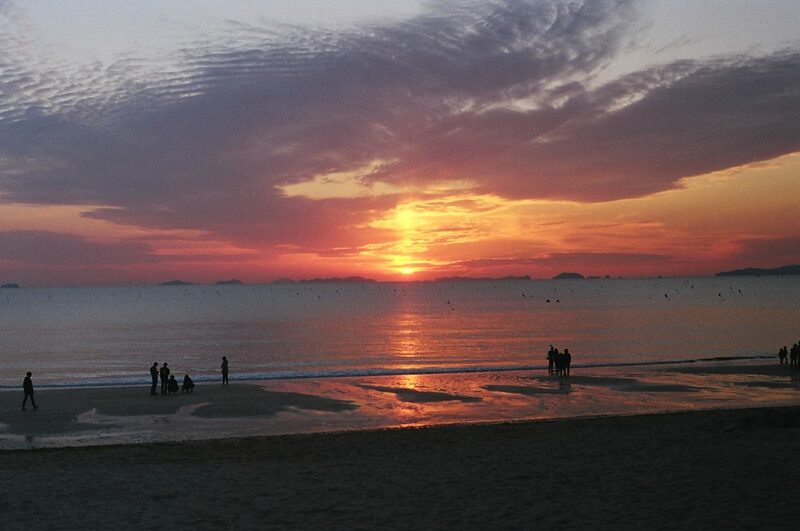 Every time I asked a Korean what I should do in Seoul, they answered, “Go to Itaewon!”. Itaewon is home to some of the most popular clubs and bars in Seoul, and the narrow streets get packed with people on their way to enjoy some food and drink. It is a fun place to see Seoul at night. The last full day of the trip, we headed south out of Seoul. 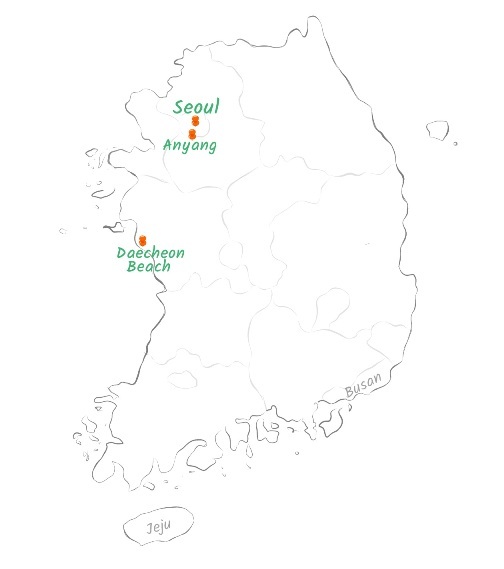 We were to catch a flight from Gunsan back to Jeju the next day, so we spent our last night at Daecheon Beach, just outside of Boryeong. The sun was setting over as we pulled up to beach, making for good photo opportunities, and a lovely way to spend the last night of our trip. We had dinner overlooking the beach and spent the evening watching fishermen casting their lines off the beach into the dark. I had an incredible time on this road trip – to see so many parts of South Korea, taste all the different foods in each region and see some of the natural beauty the country has to offer was truly an unforgettable experience. In the next blogs, I look forward to sharing more of what Jeju has to offer!